Hello, welcome to the mid-month challenge with The Crafter’s Cafe Challenge Blog! Twice a month we roll out fantastic challenges for your to play along with and we work with great sponsors so you get to see art from a wide variety of talented artists. Our challenge this fortnight is Handmade Flowers. Make some beautiful florals and put them on your creation! 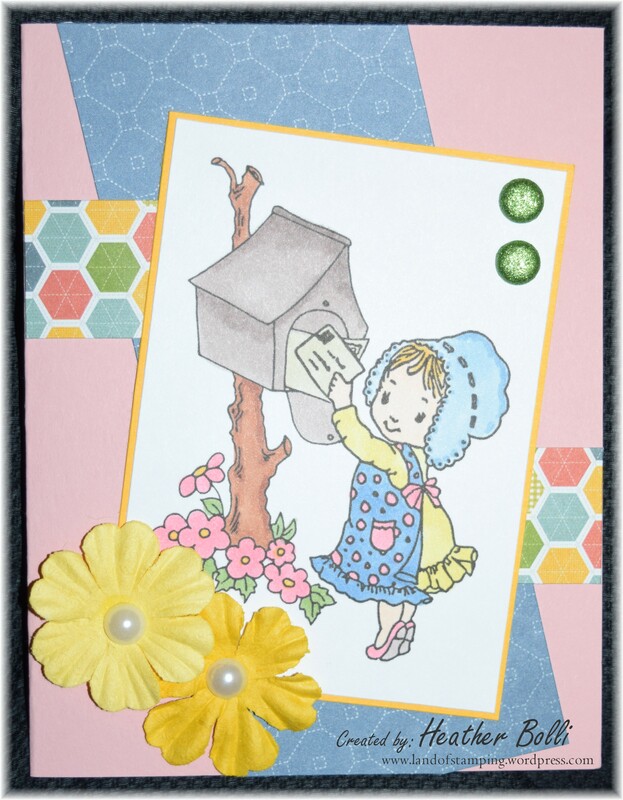 The sponsor I’m working with this time is Digi Stamps 4 Joy and I’ve got A Letter for You to play with. So…I used commercial “handmade” flowers on my card this time. Yes, I admit it. Here’s the thing – challenge are meant to inspire, not restrict you. If you’re not able to make flowers, or are crafting to relieve stress (like I was this week), then don’t put unnecessary pressure on yourself! Come play along with your vision of “handmade” flowers, and let’s inspire each other. So, come on and play in this great challenge! You can link up your entry over at The Crafter’s Cafe Challenge Blog from now through the end of the month. Come and check us out!